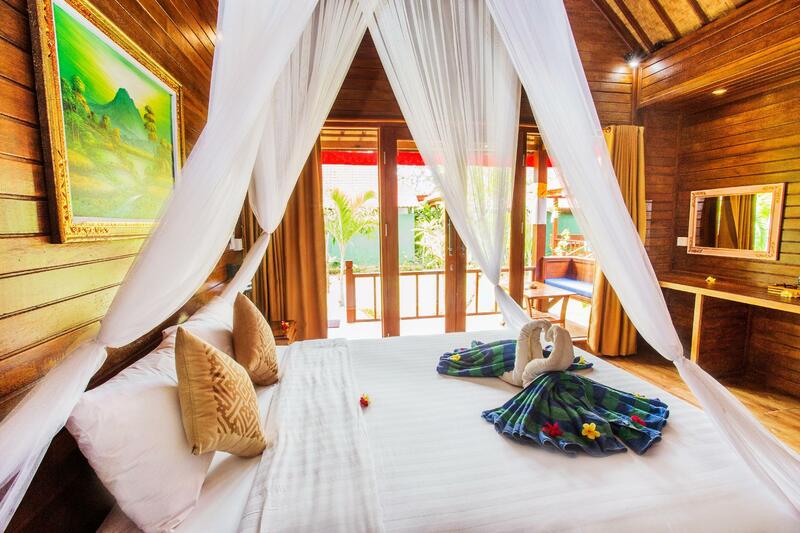 Имате въпрос към Taos House Lembongan? 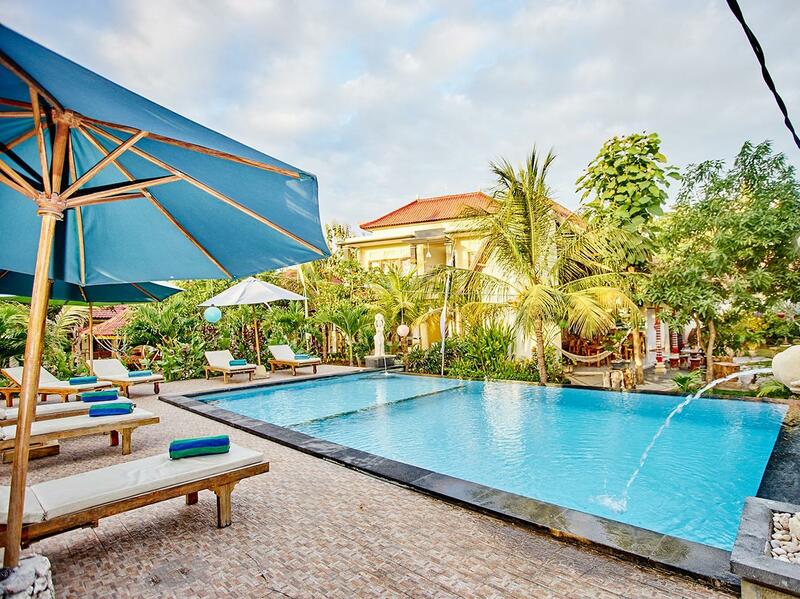 Taos House Lembongan е перфектен избор за пътуващи, които желаят да почувстват духа на Бали. Оттук гостите имат лесен достъп до всичко, което този оживен град може да предложи. С удобното си местоположение хотелът предлага лесен достъп до всички градски забележителности, които задължително трябва да се видят. Предлагайки висококачествени услуги и широка гама от удобства, Taos House Lembongan Ви осигурява възможно най-комфортния престой. 24-часов рум-сервиз, безплатен WiFi достъп във всички стаи, ежедневно почистване, таксиметрови услуги, билетни услуги са само част от нещата, които отличават Taos House Lembongan от останалите хотели в града. 6 стаи са разположени на 1 етажа като във всяка една от тях цари неповторимото усещане за домашен уют. Модерен комфорт с удобства като телевизор с плосък екран, достъп до интернет (безжичен), безжичен интернет достъп (безплатен), стаи за непушачи, климатик са на разположение в определени стаи. Хотелът предоставя най-добрите съоръжения включващи шнорхелинг, уроци по сърф, открит басейн, гмуркане, риболов, които ще Ви помогнат да отпочинете след активен ден прекаран в града. Каквато и да е причината за Вашето посещение в Бали, Taos House Lembongan е идеалното място за една вълнуваща почивка далеч от всичко. Our stay at Taos was so so. 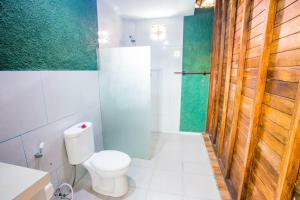 Great location near Mushroom Bay and tasty restaurants. You do need a scooter to get around, luckily nowhere is too far. The staff didn’t really seem too bothered or interested. Breakfast wasn’t the best and if you asked for toast you’d get bread slightly warmed but when you had choices of extras such as bacon or spinach which were on the menu you never received them. There’s no hot water in the salty shower which wasn’t an issue but just a heads up. The pool area is very uneven and a bit of a trip hazard. We had a few power cuts throughout our stay but that’s normal on the island. Overall, a nice place. Scooter is needed to go around. What we didn't like is that the tap has salt water (maybe common in Lembongan though). Maybe also the reason why the floor in the room was sticky. Edi, one of their staff, was really helpful and friendly. The rest is so so, not very accommodating. The staff is phenomenal and ever so helpful. I don’t do dairy and they went and got me some soy milk. Awesome place. Ended up staying 2 days longer than anticipated it was so nice. Walking distance to restaurants and Mushroom Beach. Be sure to take the fast boat to Mushroom Beach instead of the yellow bridge. It’s much closer. You can’t go wrong here. WiFi and free breakfast are included. Room are air conditioned and clean. Great pool! Pros: Rooms are good size. Refrigerator worked very well Staff super friendly Easy to rent motors coterie Cons: Aircon struggled most of the time to keep the room bearable.Staff said this was due to fluctuating voltage on the island. Breakfast was mediocre.Love that balinesse coffee though. On a 5 night stay they never change the sheets on the bed. And in order to get fresh towels I have to ask on the third day. Stayed at Taos house for a 3 night getaway. Putu was very nice. Rooms were basic. Good for an affordable getaway. Everything was perfectly clean! The bathroom was perfect and the room too. The staff was really friendly and accommodating. I will go back there anytime ! 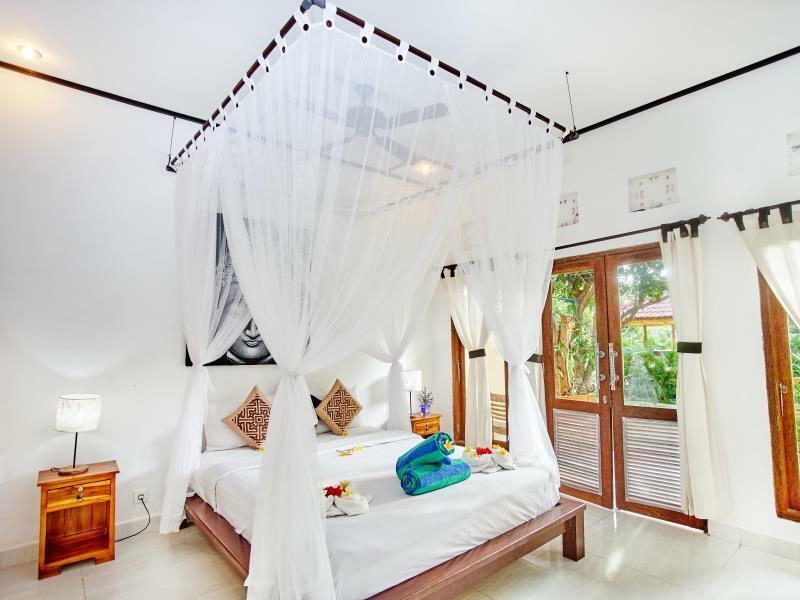 We stayed again as we loved the relaxed atmosphere of this small family run guest house. Putu and his family are really friendly and do everything to make your stay comfortable. They arrange pick up and ferry tickets, hire out scooters, can arrange surfing and other trips. Beautiful garden, clean rooms and good sized pool. We will stay again. We stayed here 6 nights. We actually booked 4 nights in advance but we liked Lembongan and the hostel so much that we booked 2 extra days. Make sure you book im advance otherwise the rooms (probably) Will be fully booked! The first 4 days we booked the deluxe room. The room had A-C, fridge and tv. The last 2 days we had to move to the standard room. No A-C unfortunately. They cleaned the room every day. Price - quality was good! Staff was very helpfull. We rented a scooter here and we booked Some tours. We liked the swimming pool as wel! Location was great too! Lovely white clean rooms. Comfortable large bed. Good location. Nice food. Amazing pool area. Friendly staff. The staff are constantly cleaning. They provide a wash towel and a pool towel. Only thing is the outdoor bathroom was great except for when it was heavily raining and you need the toilet - you get soaked and attacked by mosquitoes. Отседнахме 5 вечер/и в август 2015 г. 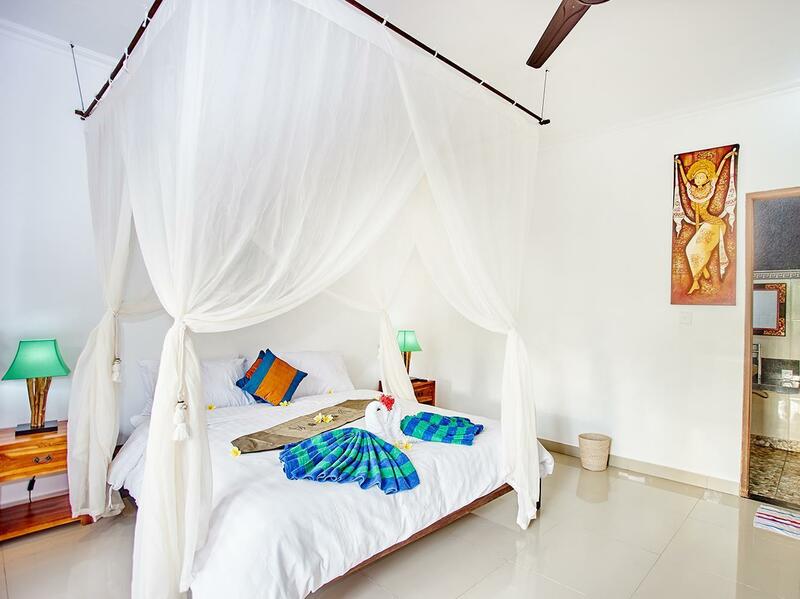 Helpful staff especially Butu, nicely landscaped gardens and pool with lovely clean tiled rooms with classy beds and mosquito nets (unnecessary as electric insect repellers) but looks great!, bathroom spacious and outdoor but infrequently cleaned. A good 6-7min walk along a bumpy moped filled road (bring torch for night time!) to Mushroom beach with a variety of cheap warungs just prior to the beach, and also along the beach. Lovely beach especially after the daytime hordes of day-trippers left but a little scary to swim through the day due to boat traffic. Maybe 30mins walk to main harbour beach. Would pick Mushroom beach over most other we saw. Breakfast adequate but a little monotonous. Overall good value. Breakfast with thick wet pancakes as no good for a price of $ 89. Pool is small. Uncomfortable chairs on private terrace. Close to road with lots of motorcycle noice. 10 minutes walk from beach full of tourist boat commerce. If you look for a lovely unspoiled island go to Nusa Penida but most tourists want to sit on each other lap. Отседнахме 4 вечер/и в юни 2015 г.
nice clean, bright rooms. lovely staff, super helpful. location eady walk to at least two beaches and quiet. Had a great time, pool was lovely and family great. In the non air con rooms you don't get a Josie net which would be useful, but the electric mosies things they supply work well! Water pressure for shower and hot water excellent! Would stay again. Breakfast could be better but quite standard for indi! Great value place. Отседнахме 5 вечер/и в юни 2015 г.